Panda diplomacy, a Chinese tradition dating back at least to the Tang dynasty, has come into play in China’s rapidly warming relations with Canada. One of the achievements of Prime Minister Stephen Harper’s visit to China last week was the announcement that China will “lend” Canada a pair of giant pandas for a period of 10 years, to be housed for 5 years each at the Toronto and Calgary zoos. “Rental” might be a better term since it was reported that Canada will have to pay $1 million per year for the privilege, not counting the estimated $200,000 annual cost to provide bamboo and other suitable nourishment for the animals. No matter. What’s important is that Harper landed the pandas, a sure sign that China is looking beyond the chilly relations between the two countries that prevailed when Harper first came into office in 2005. 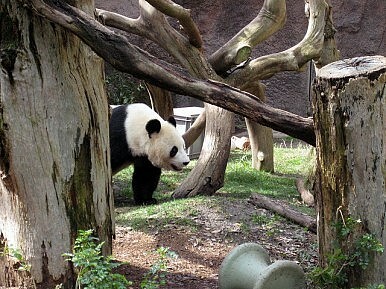 The loan of the pandas is an even greater coup for Harper domestically because he was able to achieve what former Liberal leader, Prime Minister Pierre Trudeau, was unable to deliver back in 1973 when Trudeau made the first official visit of a Canadian prime minister following Canada’s recognition of China in October 1970. Trudeau, who was considered an “old friend” of China (he had made his first visit to the Peoples’ Republic as early as 1960, in a private capacity before he entered politics), had pushed hard to get the “panda seal of approval” on Canada-China relations. China had presented a pair of pandas to President Richard Nixon in 1972 (several years before the U.S. and China normalized relations), and followed up when British Prime Minister Edward Heath visited Beijing in 1974. But there were to be no pandas for Canada, despite the fact that Trudeau travelled with two pairs of Canadian beavers that were presented to the Beijing zoo. (All have died over the years). So what was the secret sauce Harper used that was unavailable to Trudeau 40 years ago? In a word, “energy,” namely oil and gas. Back in 1973, China wasn’t the consumer of energy that it is today, and Canada didn’t have as much energy for sale, nor was it so willing to sell it. Harper made the point in China that Canada is eager to sell oil to those who wish to buy it, a calculated dig at the U.S. government for having put the approval of the Keystone XL pipeline, which would take Canadian bitumen from Alberta to Texas, into limbo. The Obama government has played election year politics by denying the current application for the pipeline, owing to vocal opposition from environmentalists, while making it clear that TransCanada Pipeline, the owner, can reapply (conveniently after the November election) for a permit with a route modification. Apart from the pandas, the concrete achievements of Harper’s foray to China are summed up in a 23 point joint declaration. Much of the declaration is window-dressing and statements of intent to follow through on work in progress, and includes everything from planned cultural exchanges to import of beef tallow to joint research on canola oil. But it also included an announcement that “substantive negotiations” on a bilateral Foreign Investment and Protection Agreement had been concluded, as well as the launching of a joint study on a future Canada-China Closer Economic Partnership Agreement (CEPA). One concrete measure was an agreement that will allow Canadian uranium producer Cameco to export Canadian yellowcake directly to China on the same terms as Australia, Kazakhstan and Russia. The agreement calls on the Chinese government to certify that the uranium will be used only for peaceful purposes such as nuclear power generation, but non-proliferation groups aren’t happy that Canada has relaxed its standards. The FIPA still needs to undergo considerable legal review and may take months, if not years to finalize (it has been under negotiation for 18 years) and a CEPA is a very long way down the road. Meanwhile, the pandas will be chewing their way through a lot of expensive bamboo, reminding all who come to view them of Harper’s success in putting Canada-China relations back on the rails. Hugh L. Stephens is a former senior official in the Canadian Department of Foreign Affairs and International Trade. He is currently Principal of Trans-Pacific Connections/TPC Consulting, based in Vancouver, BC, Canada (www.tpconnections.com). China, Canada and Oil Sands Why Canada Will Bear the Brunt of the American War on HuaweiWhat Canada's Leadership Change Means for AsiaIndia and Canada: A Match Made in Heaven?Canada as East Asia Intermediary?